Progressive Charlestown: Where are the children? 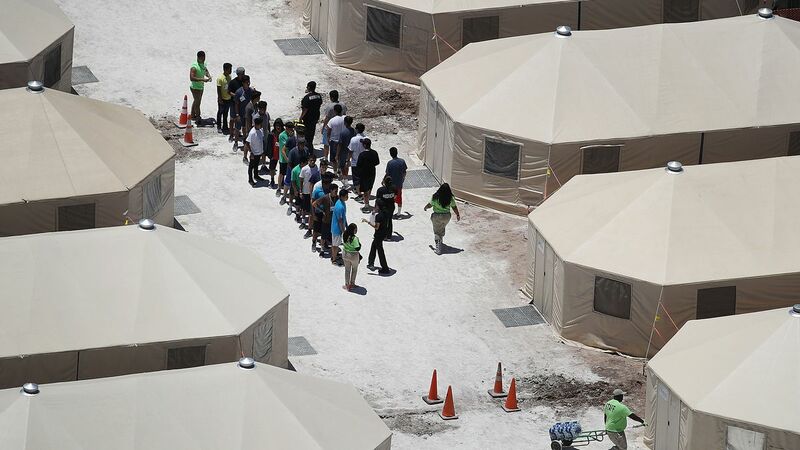 In recent weeks, hundreds of migrant children across the country have been moved to a tent camp in south Texas every week, according to a report in the New York Times. More than 1,600 kids so far have been quietly moved to the camp. Before the move, most undocumented children detained by immigration authorities were in private foster homes or shelters where they were able to receive formal schooling and meet regularly with legal representatives. The Times reports that in the tent city in Tornillo, children have limited access to legal representatives and there is no formal schooling available. Shelter workers said that the children are not given advanced warning about the move and are often awakened in the middle of the night and loaded onto buses to Texas because they are less likely to run away that way. The tent city in Tornillo, on the other hand, is unregulated, except for guidelines created by the Department of Health and Human Services. For example, schooling is not required there, as it is in regular migrant children shelters. There are an estimated 13,000 migrant kids currently in detention. More than 100 of them were separated from their families as part of the Trump administration’s policy of criminally prosecuting those who cross the border without documentation. Experts say the number of unaccompanied migrant kids in detention skyrocketed in part due to new restrictions on how kids are placed with families. The Department of Homeland Security (DHS) and the Department of Health and Human Services (HHS) now fingerprint and conduct background checks on potential sponsors for the kids. However, since many of the kids’ parents or family members are undocumented themselves, they may be less willing to come forward. Immigration and Customs Enforcement (ICE) has arrested dozens of undocumented immigrants who came forward as potential sponsors since the new policies took effect. As a result, migrant kids are also being held in custody for longer periods of time. According to HHS, since last year, the average length of time has increased from 34 days to 59. The tent camp in Tornillo originally opened in June, in the midst of the Trump administration’s family separation crisis. At the time, it had the capacity to hold 400 people. Earlier this month, HSS — which oversees the Office of Refugee Resettlement (ORR), the agency responsible for the care of unaccompanied migrant kids — announced that the facility will increase its capacity to 3,800 and will remain open through at least the end of the year. It is mostly older kids — from the ages of 13 to 17 — who are being transferred to Tornillo. The children being moved are “likely to be released sooner, and will spend less time there,” the Times reported.